Stanhoe is blessed with a surprising abundance of Neolithic objects, over fifteen separate finds spots in total. 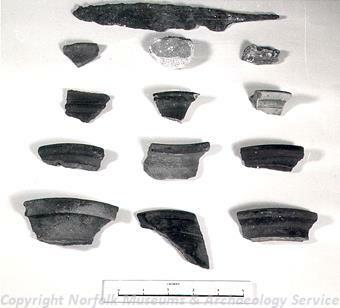 From these have been recovered flaked axeheads (NHER 1650, 1894 and 20946), and arrowheads (NHER 1652, 1898, and 14887), as well rare objects such as a sickle blade fragments (NHER 1651 and 1899) and a laurel leaf (NHER 1653). Indeed, the density of these, and the discovery of a concentration of production waste flakes has lead to the conclusion that there was a Neolithic axe factory site in this parish (NHER 12261). 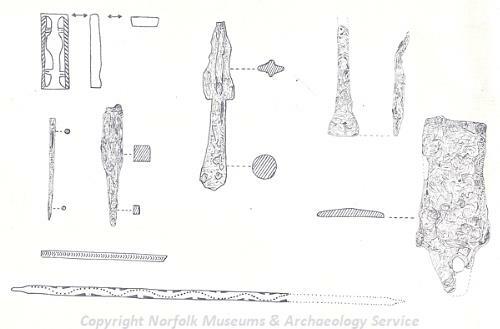 Flint production seems to continue into the Early Bronze Age, from which a knife or spearhead (NHER 1901), and arrowhead (NHER 1905) and a dagger (NHER 17355) have been recovered. However, there have been no metal objects recovered from the Bronze Age, and no evidence at all of occupation during the Iron Age. However, evidence from the Roman period is significantly more abundant. A density of finds and cropmarks lead to the identification of a possible Roman villa site (NHER 1903), from which building materials such as dressed flint, tile and hypocaust fragments have been recovered, as well as a fragment of painted wall plaster. A possible Roman enclosure or yard has also been noted, in combination with a number of Roman coins and objects (NHER 1904), and a further finds concentration has also been recorded in conjunction with a possible Roman ditch (NHER 1905). Unfortunately very little metal detecting has taken place in this parish, and so Roman period evidence is limited to these three sites. This has also affected the provision of evidence for the Saxon period, which is limited to three brief mentions in the Domesday Book. Despite this, it should be noted that by 1300 the village of Stanhoe was significant enough to gain a large church (NHER 1929), dedicated to All Saints. This large building has a southwest tower, which acts as the porch, as well as a nave and south aisle with Decorated style windows. The church was restored in 1853 and has a number of important stained glass windows by the artist Charles Kempe. It is also recorded that a medieval chapel dedicated to St Peter (NHER 1927) was also present in the parish, although it now lies beneath a modern development. The present cross at Cross Lane (NHER 1928), although largely a modern replacement, utilises the base of a medieval cross (NHER 1928), and there may have been another nearby which has since been lost. Medieval objects are limited to two glazed pottery handles (NHER 1654) and part of a copper alloy lock (NHER 16654). Although there is no evidence for a medieval manor, Stanhoe Hall (NHER 13203) does contain timbers reused from a 17th century or earlier building. The Hall itself dates to 1703 and was built for Jane Turner by her father, Sir Thomas Turner, when she married the MP Thomas Archdale. It is usually attributed to Henry Bell on the merit of stylistic features such as the bolection mouldings on the chimneypieces. Other buildings of architectural interest include Ivy Farm Barn (NHER 36053), which is of English bond red brick and dates to 1740, as well 17th century Church Farmhouse (NHER 39538) and The Grange (NHER 47072), which is a gault brick and slate house of 1830. From more recent history, it should also be noted that Stanhoe was for some time connected to the national rail network through the West Norfolk Junction Railway (NHER 13590), which later became part of the Great Eastern Railway. This railway opened in 1866 as a feeder for the Lynn and Hunstanton Railway, but was partially destroyed by flooding in 1953, and finally closed to passengers in 1952. Today the only remains of this are the names of ‘Station Farm’, ‘Station House’ and ‘Station Road’. World War Two also left its mark on the parish, and although there are no recorded defensive structures, this parish is the site of two aircraft crashes. One was a Ventura aircraft (NHER 13681), and the other, which crashed in the grounds of Stanhoe Hall (NHER 13203), occurred on the 12 June 1943 and was a Wellington aircraft of the 196th Squadron.